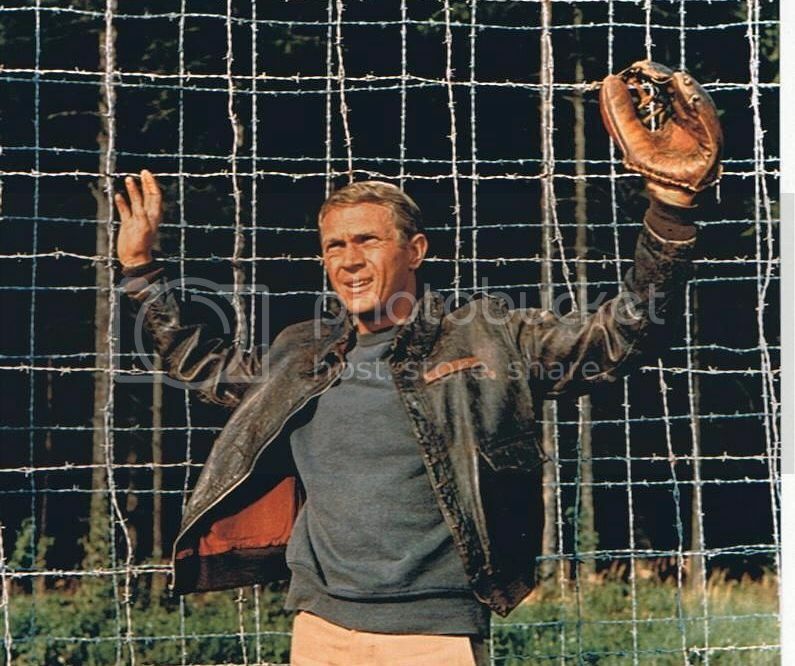 Few nights ago TV was running "The Great Escape" movie that many of us remember as Steve McQueen with his baseball glove and baseball were part of his persona. 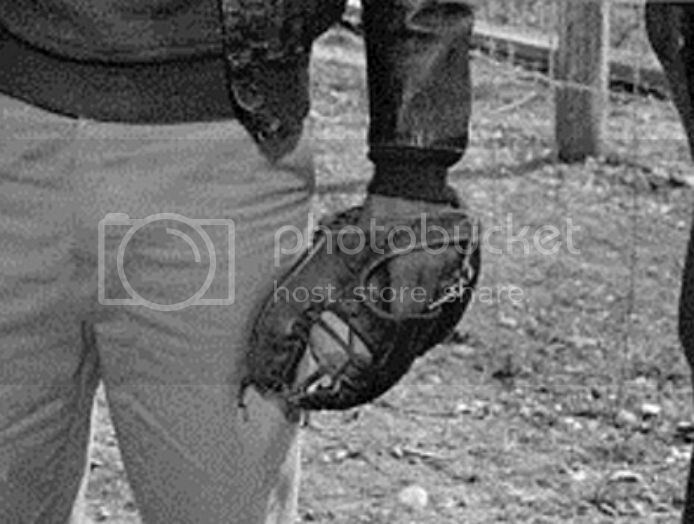 I looked at his glove when I had a chance and pretty sure it is a rolled lace Rawlings, probably an RR split finger. This topic may have been discussed before so I apologize. One of the other movie gloves I remember is the one Morgan Freeman uses in the film, "The Shawshank Redemption." It looks like a top quality and almost new glove. Guess Freeman's character "Red", the scourger, was able to finesse himself a glove. Freeman's a left-hander and throws pretty good. Based on the auction prices of his Porsches, Ferraris, and even his sunglasses - that would certainly have to be a top contender for most valuable baseball glove, possibly ever, if it were to surface. One piece front with no-rip thumb looks more like the Goldsmith models of the 1940's. I based my conclusion of Hilts/McQueen using a Goldsmith glove on the assumption the prop department would use a period correct glove. The one piece face Goldsmith glove being a likely one available in the early 1940's. 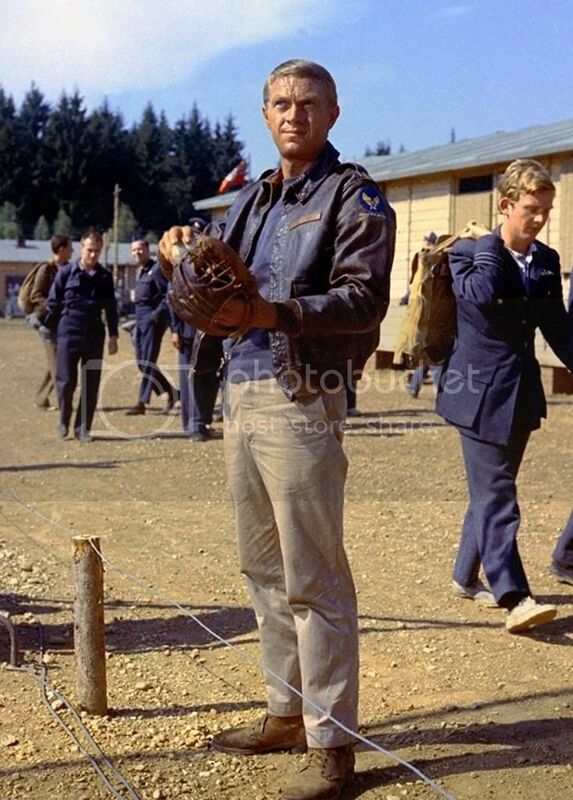 After looking at other photos, the glove appears to me to be a mid 1950's model modified by the prop department. the fingers are laced, the wrist strap is attached in an overlapped joint and the base of the webbing has a trapezoid reinforcement. The one piece face was common among various manufacturers by the mid 50's, Rawlings, MacGregor, even Denkert. There is a web site devoted to movie mistakes. The German motorcycle Hilts uses in his escape is actually a camouflaged 1960's Triumph. Kind of shakes up one's whole belief system. 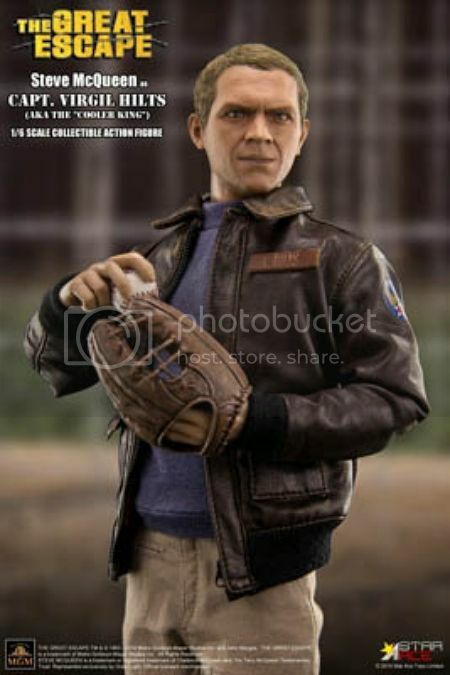 I guess it had to happen one day, The Hilts action figure doll. 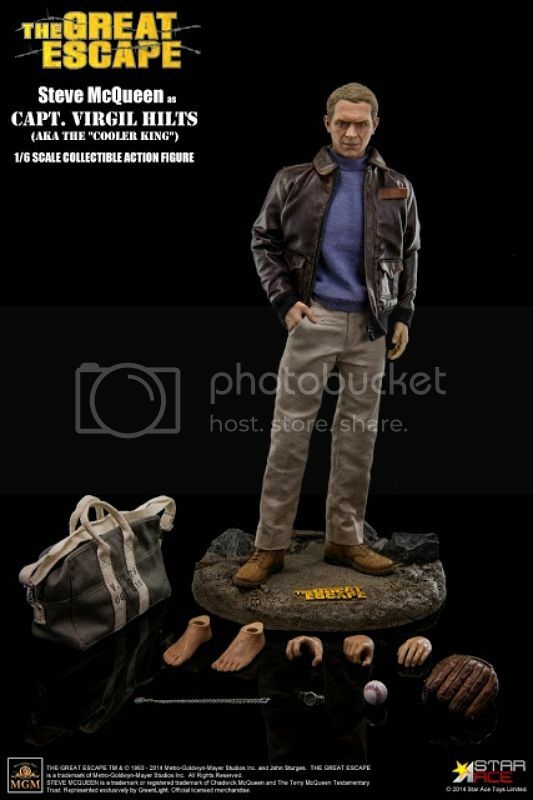 Movable limbs and various extra hands and props including the glove for one's favorite pose. Happy holiday Glovers!!! hope all is well!! long time no talk...have we ever came to consensus on what this glove is???? #1 isn't a red rolfe RR. not enough eyelets in web to make a triple tunnel? laced fingers??? 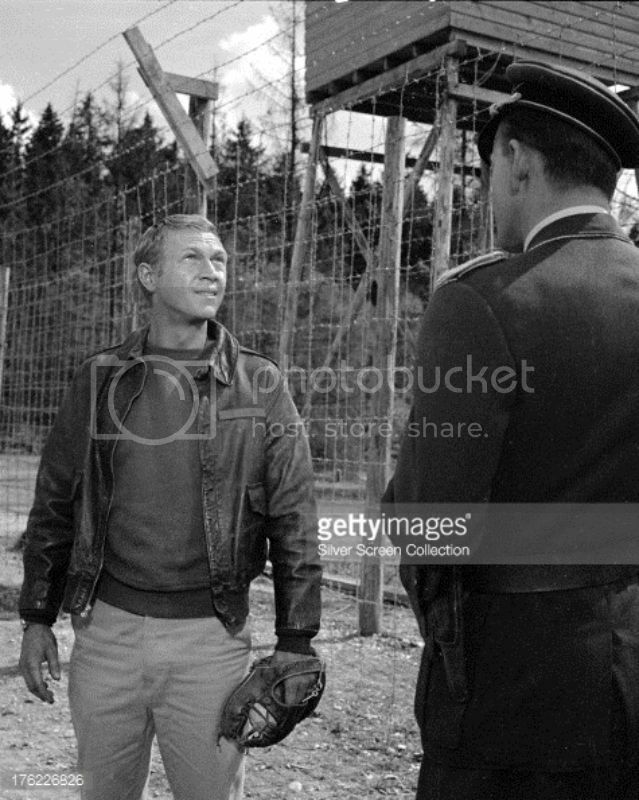 looks 50ish unless Steve McQueen wanted the fingers laced, and thought it a good idea while passing time in stalag #9, solid front as seen in other pics. (see previous posts) my gut tells me at first look a Rawlings LF??? then is that a wrist patch? maybe a simple model H doak??? something to mull over as we wait till eternity for spring training?